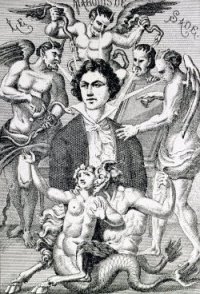 Portrait fantaisiste du marquis de Sade (English Imaginary portrait of the Marquis de Sade) is an imaginary portrait of the Marquis de Sade by H. Biberstein. It was made after the reproduction published on the frontispiece of la Correspondance de M""* Gourdan (Edition of 1866) and can most readily be found in Guillaume Apollinaire's L'Œuvre du Marquis de Sade. A modern subtitle reads "Sade soumis aux quatre vents des suggestions diaboliques." Unless indicated otherwise, the text in this article is either based on Wikipedia article "Portrait fantaisiste du marquis de Sade" or another language Wikipedia page thereof used under the terms of the GNU Free Documentation License; or on original research by Jahsonic and friends. See Art and Popular Culture's copyright notice. This page was last modified 09:38, 26 April 2013.